Scavenging for rusty tins of pet food in the ruins of humanity will be dangerous. 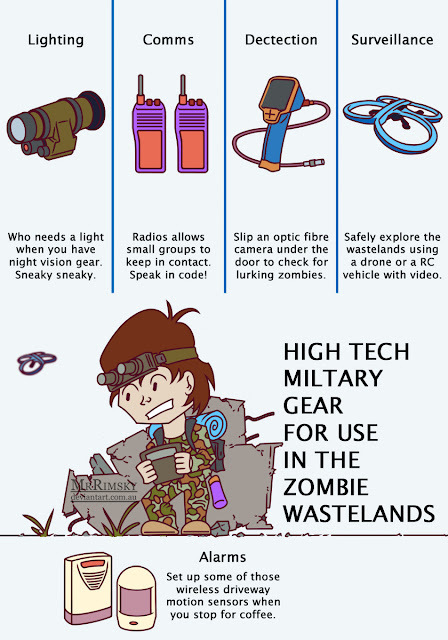 All those hungry undead prowling the zombie wastelands means you need to be extra careful. Luckily technology can give you an edge with those basic tasks like communications, lighting and detecting the walking dead. The downside with such high tech gadgets is the warranties will be void once the zombies appear. So be extra careful with your gear. Oh yeah, you will need a solar battery charge too.